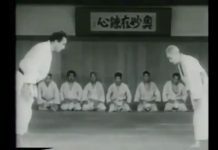 Mel Bruno received his first degree black belt from Jigaro Kano in 1935. In 1954, he was recommended by Dr. Jigoro Kano, the founder of Kodonkan Judo to receive his 5th degree black belt. and he was the first non-Oriental inUnited States to receive that rank. When he retired as a 6th degree balck belt nine years later, he was one of only three non-Japanese people in the world to hold this rank at the time. 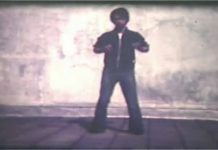 Mel Bruno later became known as Mr. Judo both in the California State Department of Corrections and the U.S. Air Force. Mel Bruno was the foster child of Roy “Pop” H. Moore Sr., a school teacher and wrestling coach at a high school in Inglewood, California. In the 1910’s Moore was a professional heavyweight wrestling champion. It was sometime during the mid to late 1920’s, that Pop Moore and his wife Gracie took Mel Bruno into their home becoming his foster parents. Pop taught judo and wrestling to both Mel, and his much younger son, Roy Jr., in the very early 1930’s. Mel eventually became the National AAU Wrestling Champion. During the 1920’s, Pop Moore had became friends with Dr. Jigoro Kano. and in 1932 Dr. Kano asked Pop Moore to be the 1932 Olympic Wrestling Coach for Japan. During the same time period Pop Moore was contacted to train some of the top Japanese judoka in wrestling. This included Professor Kotani of the Kodokan. Mel Bruno was one his foster dad’s top wrestlers at the high school, and Kotani and Bruno began training together and it was natural for a friendship to develop between Bruno and Kotani. This life-long association lasted over four decades. From 1938-1941, Mel Bruno taught judo at San Jose State University. In 1937 he introduced Judo into the San Jose State College Police Science Curriculum. During the next few years Mel Bruno was able to form San Jose’s first competitive judo team and he would actively promote California intercollegiate judo competition. 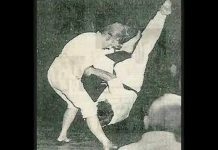 Mel Bruno is credited with teaching judo to police and military personnel. In 1940 Mel Bruno accepted a job with the California Department of Corrections as the judo instructor for prison guards. He then worked for Kenyon J. Scudder, the foremost U.S. penologist concerned with modern prison rehabilitation concepts, hired to train the first correctional employees for a newly established honor-type penal institution known as the California Institute for Men in Chino, California. The II World War forced Bruno to take a hiatus from the Department of Corrections when he was recruited by Gene Tunney, Commander of the U.S. Navy Physical Fitness Program, to work for the Physical Instructor Training School Staff in charge of combatives. 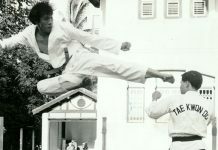 Judo became part of the Navy Instructor Training School curriculum because of Mel Bruno efforts. He also introduced and developed judo at Cornell University in Ithaca, New York. Shortly after the war, in 1946, Mel Bruno returned to California and the Department of Corrections where he was appointed to direct physical training and judo. 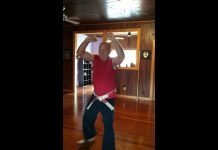 He trained correctional officers in 10 different institutions throughout the state and he also introduced judo to the Department of Mental Hygiene. In 1950, Mel Bruno was selected as one of the coaches for the U.S. Wrestling Team to tour Japan and he used this opportunity to liason with Kodokan and he acted as a representative of U.S. judo, which was called the Judo Black Belt Federation or JBBF, at that time. He was then able to present judo to the National AAU Wrestling Committee for the purpose of getting judo recognized under the Amateur Athletic Union and later he was asked to begin the organizational steps necessary to build wrestling on a national level in Japan. Later in 1951 Bruno was appointed supervisor of Judo and Combative Measures at Strategic Air Command headquarters. During his four years there he trained General LeMay and General Thomas S.Power and other key personnel. He also opened the way for Air Force classes and teams to participate in training at the Kodokan Judo Institute. The Japanese recipricated and sent a Kodokan judo theam to visit U.S. Air force bases in 1953. /during this time Mel Bruno was helping to development the Midwestern Yudanshakai. 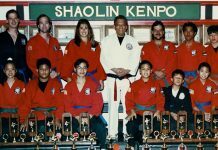 In the middle 1950’s Bruno was selected as Coach of the AAU and Air Force Team and he intoduced Judo to the USAF Academy. General Curtis Emerson LeMay then hired Mel Bruno to organize and head up United States Air Force Strategic Air Command’s Judo and Physical Conditioning unit and the SAC Judo program was born at Offutt Air Force Base, Nebraska. 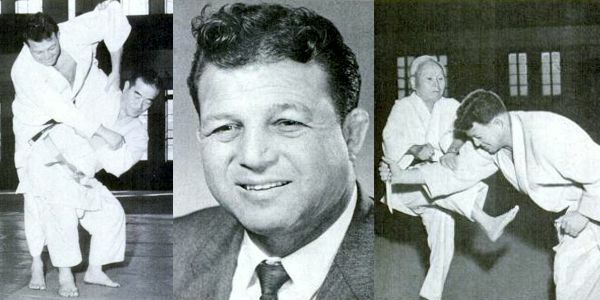 In 1955 Mel Bruno initiated the first U.S.-Japan international judo meet. Emilio Mel Bruno passed away on September 20, 2003 at the age of 89. He was thought to have suffered from Alzheimer’s Disease for two decades.